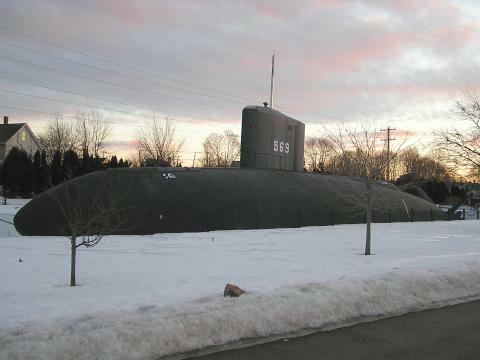 Submarines in the Winter Twilight | Watts Up With That? One of the more celebrated North Pole surfacings of the USS Skate happened today in 1959, see http://wattsupwiththat.com/2009/04/26/ice-at-the-north-pole-in-1958-not-so-thick/ for more on that and several others. The Albacore was a research submarine, and a convenient ship to view under lighting conditions similar to today at the North Pole. 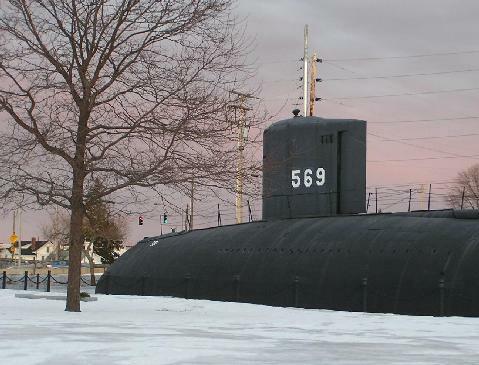 I’m not about to spend my St. Patrick’s Day at the North Pole in hopes that a sub will surface, especially since there’s a perfectly accessible submarine in Portsmouth New Hampshire at Albacore Park. I go to an annual event in Portsmouth each February, which fit quite nicely into seeking photos set in an icy, snowy setting. The rocket science part is to time the photo to match the Sun’s position below the horizon. At the North Pole the Sun rises in March and sets in September. The concept of a 24 hour day refers mainly to the longitude line the Sun is passing (it’s due south all “day” long). Sunrise, by US Naval Office definition, is when the upper limb of the Sun touches the horizon. The USNO considers the horizon to be distant and the observer is close to land or sea surface. It’s fairly easy to compute the location of the center of the Sun relative the horizon as seen from the North Pole, it’s just the “declination,” which is the celestial equivalent of latitude. There are two significant effects to take into account. 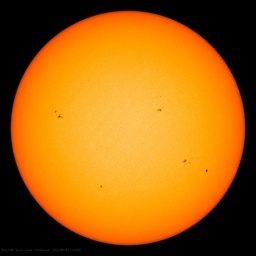 The obvious one is the Sun’s angular radius, which is about 16 arcminutes. The other is atmospheric refraction near the horizon. This is what makes the Sun and Moon look squashed when they are on the horizon. The refraction right at the horizon is about 34 arcminutes. So, sunrise occurs when geometrically the center of the Sun is 50 arcminutes (0.83°) below the horizon. An aside – on the equinoxes, night and day are supposed to be equal. Not true! At most latitudes the time from sunrise to sunset is about 12h10m then. Today, for me, is the true clock time equinox. It would be nice to know the hour, but let’s not be that obsessive. What does this tell us? First, the Sun will rise around the 19th. Second, Spring begins when the declination is 0°, and that will be on the 21st. On the 17th, the entire Sun is below the horizon and the upper limb is 0.70° below the horizon. This puts us well into morning twilight. Twilight – what’s that? Let’s take a look from a North Pole point of view, and start when it’s just plain dark. Another aside – at the start of winter at the North Pole, the Sun is 23.44° below the horizon. However, the Full Moon will be between some 18° to 28° above the horizon. Yes, it’s nighttime, but not completely dark all the time. If we discount the Moon and clouds, the sky is dark at the start of Winter with only stars providing feeble light. In late January, the Sun climbs above 18° below the horizon and we enter Astronomical Twilight. This is a period where there is enough light from the Sun that it interferes with seeing faint objects in the sky, especially those nearest the rising Sun. In mid February the Sun reaches 12° and we enter Nautical Twilight. Brighter, but mariners can still easily see the stars used for navigation. By early March the Sun reaches 6°, now the navigational stars are fading from view and we’re in Civil Twilight and people can get around pretty well without extra light. From the above, we can tell Civil Twilight will last a couple weeks and then daylight begins. Now, let’s shift our point of view to Portsmouth. I’m also shifting to the evening because I took these photos after sunset. Civil twilight here lasts about half an hour, which fits in well with both our experience and state motor vehicle law that requires headlights to be on by half an hour after sunset. Another aside – twilight is longest at the Summer Solstice, shorter at the Winter Solstice, but shortest near the equinoxes. If there’s interest, I’ll go into more details in the comments. At sunset, the solar altitude is -0.83°, we want the time when it’s about -1.53°. We know during Civil twilight the Sun will drop 5.16&deg, so interpolating, that’s about 4 minutes after sunset, and gee, there should be plenty of light. While the the visitor center and Albacore were locked, I could park there and walk around the trench used to bring in the Albacore. And indeed, there was plenty of light, as the photos prove. Just one other thing – yes, black and white films in the late 1950s were plenty fast enough. The photographer probably used Tri-X (ASA 400) or Royal-X (ASA 1200). The latter was so grainy that it generally was only used in large format cameras. I had my camera set to a ASA 400 (or maybe even 100) equivalent. Lord Monckton has probably figured all this out, but now we all know that there was plenty light and we know where to find a submarine in a snowy environment. Have you ever wondered how many photographs there are of submarines that have traffic lights in the background? No, neither have I. The Albacore is an interesting vessel, several design experiments with it influenced the next generation of submarines. I'm always a sucker for interesting mechanical contraptions and this counter rotating screw caught my eye. I guess a sub with a single screw could have some interesting handling issues. I’ve been fascinated by submarines since before the first patrol I served on one…. 1974. Volunteered for subs in ’72. That “screw” is NOT fake. The Albacore was a 1950s experimental diesel powered sub. 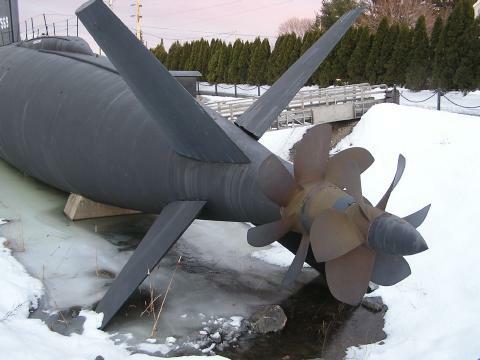 The testing of designs, including propellers, using it led to new shapes and applications that were utilized in the nuclear subs that were built in following years. The Albacore was decommissioned in ’72. Why not favor us with the actual, classic photo of USS Skate riding comfortably at 90 North? I believe that’s more for efficiency than steering. There are two in Holbrook NSW not far from one of the great pie shops of all time. lol, that’s good Ric, very detailed. Couldn’t you have just stated that it’s light outside right before sunrise and right after sunset? At any rate, when Monckton seemingly throws in a off-hand comment like, when “Lord Monckton noted that at the time of this surfacing it was late winter and the Sun hadn’t risen.” I often attribute that to bait. It’s a great argument style, which, I employ at times. CAGW “science” is also in that category. Counter rotating screws to neutralize the torque, I guess? There is also a picute of Skate surfaced “in the Artic” in 1959. Looks like plenty of light ot me. I had GREAT success pushing that to 1600+ with fantastic results when taking photos of sports inside a gym. This page can help you with the Arctic light question. If any of you want to speak to experts on Submarines, get in touch with the Dock Museum, Barrow in Furness Cumbria UK. We have been building world class submarines here for well over a hundred years. This town has marine engineering in it’s blood and almost nobody who believes in Catastrophic Anthropological Climate Change. I always thought submarine screws were designed to be as quiet as possible ? So, with one post, Ric, has managed to combine submarines, astronomy and Lord Monckton. No, we’re all getting screw.. by the “science” of CAGW! Have to say I am a little confused about the point of your post. The stages of astronomical twilight and phases of the moon are fully monitored by submariners (and villains) all around the world. I suspect, but I am no means certain that you believe Monckton was suggesting the photo a fake. No way would a crew of 100 plus sailors be able to do that. Jack does not do fake. A fun and interesting post. The photo of a sub in a park is a hoot! I remember one captain who had spent years driving a bouy tender that had one screw. They retired that boat and he got its two screw replacement. He provided us with hours of mirth before he got the hang of the thing. The most fun part was docking where there was a strong current. With the old boat he would nose into the dock and haul on the throttle and the stern would swing over real nice like. With the new boat … no docks were actually destroyed and the boat didn’t get any major dents. Unless you could control them independently, the counter-rotating screws look like the worst of both worlds. The only way to steer the boat would be with the rudder. Of course all this stuff about the boat is a red herring. The real deal is that there was enough unfrozen water at the north pole for a submarine to surface. I don’t know this, but contra rotation would probably dampen noise. Run silent…..run deep. Just in passing, forget propellers look propulsors. Bob deems to have some resistance to the idea that ice floating on water moves around and that gaps open up that allow submarines to surface. No melting required. No low ice extent required. Maybe the skate logs should be read to see if they had trouble finding openings through which they could surface. The probably even logged the ice thickness above them. If the ice on average was a lot thicker than today that would put paid to this stubborn belief in low ice in the 1950s. In fact wasnt a book written about these expeditions? Except of course there wasn’t, the Skate surfaced through a frozen lead. It’s funny how you guys are always quoting from this book!!!!! Must be lots of refutations of the existence of lots of ice in 1950s Arctic in there. A brilliant post, with some really interesting info about subs and the Arctic – and on St Patrick’s Day! Who could ask for more? Thank you all! A picture of the USS Skate at the North Pole, Commander James F Calvert USN from his book “Surface At The Pole: The Extraordinary Voyages Of The USS Skate” first published 1966 . BS, look at the picture, it was more than a lead. The polar bears sniffing around the sub in another photo, shows a peak predator examining its prey. In the first one, the bear tries to eat the rudder. Damage was said to be minor. Commander James Calvert, skipper of the Skate in his book “Surface at the Pole”! I think that just before the spring equinox at the north pole there would be no darkness as the sun would circle the horizon and be just below the horizon. The time would seem to not be important for lighting as it would always be dawn for several days just before the sun goes above the horizon. Contra-rotating screws are, indeed for quiet. Single screws on a shaft can and do “cavitate” (leading edge, low pressure, bubble collapse) making a ton of noise. Throttlemen on submarines have to be very careful about how quickly they open the throttles to avoid cavitation at shallow depths. Do not confuse single, twin and contra-rotating screws, please. Ric is trying to replicate the lighting conditions while not being at the Pole, hence all that stuff he wrote. A few years ago, before I began my climate science research, I did some research on calculating the time of sunrise and sunset from any position on earth. I found some code in basic that I converted into C# so I could make an app that would run on my pocket/mobile pc. Some time afterwards I lost that work and the downloaded code in a rare triple failure of my hard drive in a parity raid setup as well as the backup. (warning, never use RAID as your only backup solution) . So began a long journey involving several years of studying calculus then getting side tracked by my climate science studies, and I still haven’t written any code to calculate sunrise/sunset. But I sure have learned a lot. (Note that I also began studying calculus to help me to both understand a book on “The Finite Element Method”, as well as to help me solve a computer programming problem related to physics). I did find a good start to writing my own algorithm by downloading this text (ascii ?) file describing methods to use to do the calculations. From my experience, Ric seems to have hit all the bases. The only thing missing perhaps is the mention of a “sidereal day” which might or might not be relevant. But that isn’t a photo of the March 17 surfacing at the N Pole, …. At this point, I’m not sure which photo people are talking about. I thought it was the lead photo at http://wattsupwiththat.com/2009/04/26/ice-at-the-north-pole-in-1958-not-so-thick/ which states it’s from March 17th. However, the source for it is http://www.navsource.org/archives/08/08578.htm which states the date was perhaps August 1958. I wasn’t really expecting to find a WUWT bug an iconic image likely isn’t what we thought it to be…. Has anyone found other March 17, 1959 photos besides the one at http://www.vintagehikingdepot.com/wp-content/uploads/2012/02/funeral-570×383.jpg ? I could see through the periscope two small black spots on the underside of the thin ice. Suddenly I could make out ripples in them. It was the first open water we had seen on the cruise. The puddles, about 2 feet in diameter, showed that the ice in this lead must be very new. So, it’s beginning to sound as though there wasn’t as much open water then as we’ve thought. Finally, this is also covered (and fought over with slung mud) over at http://www.real-science.com/navy . Things get pretty ugly a third of the way in, don’t bother to read the rest. I think that’s a fairly good page, some of the solar collector equations might be worth revisiting some time. It does suffer from not explaining the physics well, that will slow you down. I also wrote my own program from scratch, in 1980 or so in Basic for a TRS-80. The poor machine needed some 10 ms to compute a sin or cosine. I eventually translated it into C, and seeing it run on a ultra fast (for the year) DEC Alpha was impressive. I used it to generate the data in the main post, it’s now running on my x86 Linux system. It’s probably the oldest program I use on a regular basis. One big problem I had was trying to figure out a good starting date for Earth’s perihelion, as I included precession of the equinoxes in the calculations. The date didn’t change the same amount each year. I eventually realized the USNO must be taking the effect of the Moon on Earth’s location, barycenters and all that. I came up with a decent date after looking at years with full Moons near perihelion. All in all, it’s held up pretty well. It computed this year’s Vernal Equinox just two minutes off of USNO’s figure. I completely gave up trying to understand the Moon’s motion. When I read that gave Isaac Newton headaches, I was rather relieved. Check out http://wermenh.com/eqoftm.html . It’s an old essay originally written to post on sci.astro every December before people would ask why the earlier sunset is before the solstice. The references are also old, but were the main resources I used to write my sunrise/sunset program. One author, Jean Meeus, has commented at WUWT from time to time. Yeah, I think that’s completely irrelevant, at least in my lifetime. OTOH, I’m pretty sure that Monckton was referring to that photo that is now apparently from August. While the visual starting appears to be completely wrong, I hope the rest of the post withstand Monckton’s review if he sees it. Skate (SSN-578), surfaced at the North Pole, 17 March 1959. History on that photo changed there at NAVSOURCE since then, probably due to alarmist pressure from Wiki etc. and other folks like Neven who went ballistic over the picture when I highlighted it. It is “inconvenient” in March (during peak ice season) but soothing for them in August (during near peak melt season). The picture may have been taken a couple of days after the funeral photo in March alluded to upthread. Contra rotating makes the sound signature clearly known. And is not necessary. That is why most submarines have only one screw, or rarely a pump jet. Hit the Albacore Park Link. Fascinating story and I’d say the taxpayers got their money’s worth on that one. Note the surface Navy considered the submarine arm as the enemy. I just read a book on John Boyd. Even during the cold war the USAF was the enemy in the Pentagon. I just got told this afternoon it isn’t much different between the RAAF and Australian Army at present. I can imagine the conversation with Mrs Polar Bear later. “You shoulda seen the size of that seal! And it got away! The Albacore is an excellent thing to visit. We did in July a few years back. Maybe because there were two of us and we were adults, we were allowed in unaccompanied. I spent a couple of hours inside sitting in the various places where one could sit, admiring the X diesels, the gauges, the injector tester, and just generally absorbing the machinery. At the time, they had not public-proofed it. Maybe they still haven’t. It seemed to me to be totally un-vandalized and very very complete, down to a typewriter in the radio room. Sigh – I didn’t have time to review all of that 2009 post, I’d forgotten how controversy in the comments (and mine noting the Sun’s declination. I’m away for most of the day to collect our “critter cam” that spent the winter at the top our Mt Cardigan property. Moose and others like to hang out between the logged property and the state forest uphill. I’m tempted to hunt down a Navy historian to help out in all this. I thought I was writing a simple, geometrical account of twilight…. “USS Skate did indeed surface at the North Pole but not until 17 March 1959. Ice conditions in August 1958 were too heavy at the Pole for the Skate to surface, as they were for the Nautilus some days earlier. The Skate did surface in several other leads and polynya that August, including one near Ice-station Alfa. The above picture may have been from one of those. Should that whet your appetite for the Solomons campaign you might like to get hold of a copy of The Coastwatchers by Eric Feldt to put it all into perspective, particularly how instrumental submarines were in the crucial turning point of the Pacific War. bearing in mind they were mostly a bunch of 17-21 year olds. I realized my father was only 19 when he signed up after I discovered a Soldiers Service Book tucked away in his personal effects upon his death and began piecing together some old war stories with the power of the internet. According to my father it was a complete disaster with swamped landing craft due to an intense tropical storm and no doubt some telegrams home were fudged as to how some young sons really died. No matter they were off to Guadalcanal to try and get it right the next time. Sounds like a possible primary source. If you are still reading this thread could you elaborate on his status? If he is still with us perhaps you might arrange for an interview of him on the record so he can at least get his important eyewitness experience documented! Maybe he has his own private photos. [Reply:Great find, thanks. The lead photo (split over two pages is one I hadn’t seen before. Wow, I can’t believe I didn’t take the opportunity to mention that I worked for International Submarine Engineering for 6 years, when they made half of the total global underwater remotely operated vehicles (ROVs), as well as AUVs, USVs and other interesting projects, some classified perhaps 😉 . The president, James McFarlane was in the navy before he started his company. I wonder what connections he still has. The photo of the young sailor in the Bluenose ceremony from the Life Magazine article brings back memories. The missile sub I was on went north of the arctic circle twice. Being a missile sub on a cold war deterrent patrol, we didn’t go far north to go under the ice ( so far as I know). This thread (and the related one the other day) is so cool. It has everything – humour, pathos, bathos, history, geography, astronomy, physics, engineering etc, and lots of anecdotes, some of which may even be shaggy dog stories. What’s not to like? A lot of interest here – intuitively it would seem that twilight (and the opposite in the morning) waxes and wanes with the solstices. Plus, anecdotally, where I live (about 35 degrees south) the night falls like a brick in mid winter, in a few minutes. Just now, near the equinox, there is still some twilight. But perhaps I have missed something in the definitions? On further thought, I am guessing that the point about twilights relates to longitude. They don’t have much at either end of the day near the Equator. A photograph of the Skate during the actual event, takne by Commander James F. Calvert. Hmmm, I will just leave a few pictures from the NOAA North Pole web Cam, showing the actual lighting conditions and shadows, depending on the seasons, at the pole, under clear weather conditions. Here are some twilight notes. I like to look at various extreme situations, then show how they fit with in-between places and situations. Let’s start at an equinox, if you want, assume the Earth isn’t tilted, then we’d be in a permanent equinox. The Sun will have a declination of 0° this means that the Sun is moving as fast as it can across the sky – 1° every 4 minutes. If you’re on the equator, the sun rises due East, passes overhead, and sets due south. Let’s just consider almost sunset (when the center of the sun is on the horizon (but appears to be a bit higher) and Civil Twilight (the period between the Sun setting and being 6° below the horizon. At 1° per 4 minutes, it takes only 24 minutes for twilight to end. When the Sun sets at the equator, it heads straight down. At either pole, the Sun is still moving 1° per 4 minutes, but now the motion appears horizontal and the Sun just scrapes along the horizon. At temperate latitudes, the Sun is moving just as fast, but now it goes beneath the horizon at an angle, and the vertical rate is between what we saw at the equator and poles. That means twilight will lengthen as you get further from the equator.. In the summer, the sun still moves 360° around the sky, but given its 23.44° declination, it’s moving less that 1° every 4 minutes. This would be more obvious if the Earth had a bigger tilt. If we were nearly on our side, like Uranus, the Sun would make just a little circle around the Earth’s axis. On the equator, the Sun still heads straight down, but at a slightly slower rate. More impressive is what happens in temperate latitudes. When the Sun has set, the path of its motion behind the Earth has its vertical component slowing. At Noon, the Sun was high in the sky, but in the afternoon it starts sinking faster and faster until about 6 PM when it begins to slow down and reverses at midnight. The Sun sets later than 6 PM, so at sunset its rate of fall has declined quite a bit. It also sets poleward of due west. So it makes a smaller angle as it crosses the horizon, and that reduces the vertical velocity too. Ultimately, it takes more time to reach the end of twilight. In the winter, the Sun sets while its descent is accelerating. It also sets equatorward of due west making a steeper angle as it crosses the horizon. These conflicting attributes wind up leaving the twilight longer than at the equinox, whereas in the summer, everything combines to make twilight longer than at any other day.